The highly ambitious eco-retrofit of an 1840’s house in Birmingham — completed six years ago — employed a swathe of natural and ecological materials, cut the house’s energy consumption down to passive house levels, and now employs only renewable energy to heat and power it. The house was designed by architect John Christophers of Associated Architects — working here in a personal capacity — for his young family, after they bought the house with the intention of retrofitting. 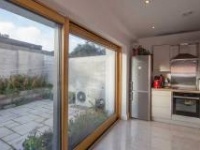 Dubbed the Zero Carbon House, it was the first retrofit in the country to reach level six on the Code for Sustainable Homes. Before the build Christophers considered aiming for the passive house standard, but there was no passive retrofit standard at the time. 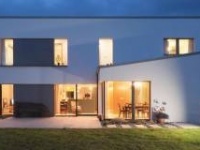 The Code for Sustainable Homes had just been launched as the UK’s primary green building rating system, and Christophers was keen to develop a project that could be taken into the mainstream and replicated. So he chose to aim for code level six, which ruled out the use of fossil fuels, and imposed a slew of other strict eco-standards of water consumption, materials and biodiversity. But the house still has passive principles at its heart — with its emphasis on airtightness, thermal bridge free design, and lots of insulation. Christophers wrapped most of the external walls with a Neopor EPS system from Sto. To minimise thermal bridging, he insisted this be installed without mechanical fixings, so the team used an epoxy adhesive instead. Christophers took a different approach with the front elevation, insulating it internally with 350mm of Warmcel — fitted into new timber studwork — to preserve the house’s historic facade. “We’ve got lovely old brickwork and stone facings and so forth which we didn’t want to lose,” he says. To deal with any potential condensation behind the internal insulation, where the temperature drop could create a dew point for water vapour to condense to liquid, there is a drained cavity here. The original roof was mostly retained, but the old ceiling joists were taken out. The team put in a framework of new timbers hanging from the original rafters, creating a void of 450mm that is filled with Warmcel and lined below with a Pro Clima Intello Plus membrane for airtightness and vapour control. A new extension has roughly doubled the size of the house, adding a second floor and extending onto vacant ground beside the house. The new walls were constructed with Sumatec Earth Blocks, manufactured from hydraulically compressed clay. 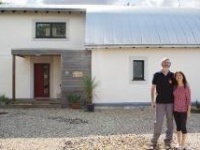 Christophers previously developed an interest in earth-based building materials while working on an eco house in Worcester, which had cob walls made from earth dug up on site. Sumatec blocks, he says, are naturally able to regulate humidity by absorbing water vapour and releasing it, while they also provide thermal mass that helps to buffer indoor temperatures. The emphasis on earth-based materials continues to the ground floor, which is finished throughout the house with rammed earth formed from clay dug up on site, then finished with linseed oil and beeswax. “It’s as hard as any sedimentary rock after a few years,” says Christophers. In the old part of the house, the existing floor joists were treated and insulated with Warmcel and made airtight with an Intello Plus membrane (there is a ventilated cellar beneath). All of the external walls are finished inside with a lime plaster that also serves as an airtightness layer. The final airtightness test produced a result of 0.97 m3/hr/m2 — or 0.57 air changes per hour in passive house terms, just inside the new build passive standard, and quite an astonishing result for a time when there were few references for passive retrofit. 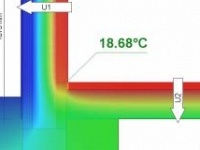 (By contrast a blower door test taken before the retrofit produced a result of 28 m3/h3/m2, almost thirty times leakier). Christophers and his team used a small blower door machine and smoke pencils continuously during the build, to ensure there would be no major surprises come the final test. “I suppose what I’ve learned is that to do airtightness…you have to be completely obsessive about detail,” he says. He praises his contractor, Speller Metcalfe, who he says had an appetite for “not being daunted by things” (the builders also recycled almost 100% of construction waste during the project). In terms of heating — and besides internal gains from occupants and electrical appliances — the house has an eight square metre solar thermal array which feeds an 850 litre thermal store, which delivers domestic hot water and services one towel radiator. In very cold weather, the family can also light a wood burning stove, which delivers 20% of its heat for direct space heating and 80% to the cylinder. “We’ve never needed to light that stove past about the eighth of February,” Christophers says. All of the wood used for the stove to date has come from an ash tree in the garden, which was cut back during the build as a condition of planning permission (the tree’s leaves also provides shade in summer to the south-west facade). Mechanical ventilation with heat recovery (MVHR) provides fresh pre-heated air in winter, but Christophers says he turns off the MVHR in summer to save electricity and rely on natural ventilation. Secure vents are opened at night to purge the house of heat, while highlevel windows encourage a natural stack effect that draws warm stale air up and out of the building. In the spring and autumn, Christophers can combine these two approaches, relying on windows on warm days but letting the MVHR run on low background levels at night. The house also has a 32 square metre solar PV array on its roof, and selling energy back to grid means that rather than paying for electricity, the family earn on average £1,500 net for it every year. Meanwhile rainwater is collected from 80% of the roof space and filtered into a 2,500 litre tank in the basement — from there it is used for the toilets, washing machine, and a dedicated spray tap in the kitchen. Bat boxes and bird boxes were also built into the house and garden walls during the build to encourage biodiversity. And other natural and recycled materials abound through the property too — there’s reclaimed brass ironmongery, recycled structural timbers, kitchen surfaces made from recycled glass, a limecrete slab under the new extension, plus 200 year old Canadian maple, taken from a demolished local factory and used for the kitchen, window seats, balcony and elsewhere. The house has been the subject of extensive monitoring for the last four and a half years by a team from the Zero Carbon Lab at Birmingham City University, led by Professor Lubo Jankovic. Every minute, sensors collect twenty different parameters including indoor air temperatures, relative humidity, and CO2 concentration; the energy produced by each of the solar thermal and wood burning stove; and the electricity generated, consumed (within the house) and exported (to the grid) by the solar PV system. One research paper by Jankovic and his colleague Dr Halla Huws examined whether ZCH could remain zero carbon in future — or whether it might need air conditioning or other electrical systems to cool it down in future as the climate warms. Modelling the house, they found that applying two passive shading devices — a brise soleil and external louvres to the south west facade — would help to prevent overheating in future, but the effect diminishes as temperatures rise. However, they found combining this with some form of free cooling, such as using the MVHR’s summer bypass feature, would cut overheating by 59% in the year 2080 (or 95 hours over 28C). Jankovic’s research points to the difficulty of designing a building that will have low carbon emissions and high occupant comfort both now and in the future — both our buildings and their occupants will need to adapt to some extent. Speaking to Passive House Plus, he says we may need to retrofit our buildings with passive cooling systems in future, or even design insulation systems that can be later peeled off. So far, 99% of indoor temperatures recorded have been below 28C. But his research emphasises the importance of modelling new buildings under future climate change scenarios, and of monitoring temperatures inside them, as indoor environments may get slowly warmer over the coming decades without occupants noticing. (Of course overheating is something that will effect all buildings as the climate gets warmer, not just well insulated buildings, which may actually be better protected — see this article. Jankovic had yet to fully process some of the other data relevant to indoor comfort at the time of going to print. However, he sent Passive House Plus raw indoor temperature and relative humidity data from April to September of this year. The data shows temperatures in the studio, study, bedroom, and living room remaining relatively stable around the 20C mark, with occasional spikes over 25C in the bedroom during hot weather. Relative humidity is generally at a healthy level between 40% and 60%, though there are regular peaks and troughs within this range, as the sensor is located in the kitchen. The retrofit, Jankovic and Huws also calculated, slashed the building’s annual heat demand by 96%, from 59MWh to just 1.78 MWh, while annual carbon emissions have been cut to 21,000 kg of CO2 to minus 660g — meaning the building saves more carbon than it now produces, making it truly zero carbon. The only ‘mistake’ Christophers’ has had to correct in five years is the front door — which was originally installed on a timber frame that moved with seasonal humidity, creating some minor draughts. “We’ve just recently rebuilt that door on a more stable thermally broken frame which I think has made a huge difference,” he says. House - Making It Stay Zero Carbon Through Climate Change’. Fixed roof lights: Frameless triple-glazed units sealed to building structure, warm edge spacers, argon-filled, two soft low-E coated, Ug = 0.55 W/m2K. Primary heating system: 8 square metre solar thermal array feeds 850 litre thermal store hot water cylinder. From this, one towel radiator in the shower room is fed. In very cold weather, the Lenius 7kW wood-burning stove is lit — 80% of the stove heat tops up the thermal store, 20% is space heating. Winter and spring night time: Itho Eco4 MVHR unit (by Green Building Store) to all rooms, manufacture's thermal efficiency 92% or better.